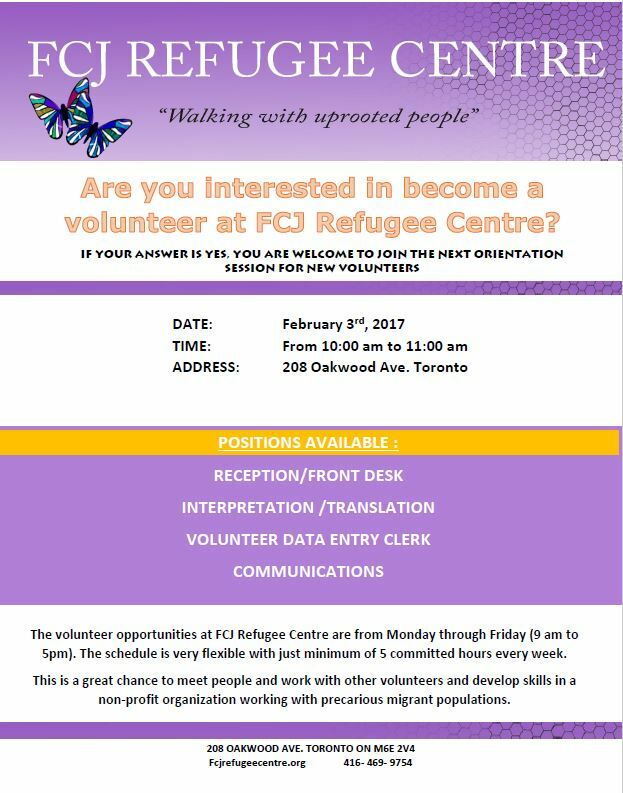 The first step to become a volunteer at FCJ Refugee Centre is to participate in the Orientation Session. Our upcoming Orientation session is scheduled on February 3rd from 10 am to 11 am at our location (208 Oakwood Ave. Toronto). During this session we will talk about our organization, how it works, programs, activities and current volunteer positions available. After the presentation you can choose among the volunteer positions. Please keep in mind that our office is open from Monday to Friday from 9:00 am to 5:00 pm; Once you already identify the area you want to volunteer, you are ready to sign the volunteer form and confidentiality agreement with FCJ Refugee Centre; and you are ready to start your volunteer position at our centre.